Luxuous & modern apartment for 4 persons, with air conditioner, jaccuzzi & sea view, next to the Palais des Festivals and beaches. Charming 85m ² apartment, located in the heart of Cannes, just next to the Suquet historic quarter. 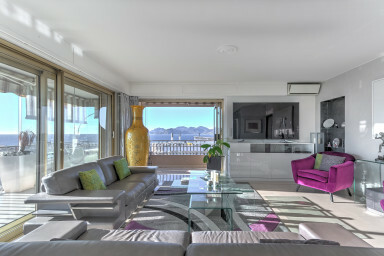 It offers all the comfort for an exceptional stay in Cannes. Ideal for delegates (10 minutes walk from the Palais des Festivals) and tourists (7 minutes walk from the beach). This 1 bedroom well decorated apartment, can comfortably accommodate 4 people. The living room / dining room with a flat screen and a sea view has double bed. You have access to a hudge 36m² terrace south exposed. And you have access to the jaccuzzi in the terrace with a beautiful sea view and town view. There is a bedroom with a queen size bed (180X200) with air conditionner and TV. There is a bathroom with shower and WC. An american kitchen fully equipped with everything you need to prepare your favorite dishes : oven, fridge, Nespresso, kettle, toaster, dishwasher. Naturally, you will have free WiFi access and air conditionner in all the rooms, as well as all the amenities facilities to ensure your stay with comfort : sheets and towels of quality, an IMMOGROOM welcome pack ( toilet paper, trash bags, etc. ), iron and ironing board, hair dryer, hangers, household equipment (vacuum, bucket, mop), as well as a washing-machine. The apartment is on the 7th floor (with lift). The keys and badges will be given to you, on your arrival a person will accommodate you in front of the residence. This apartment is managed by IMMOGROOM. Our staff will welcome you upon arrival and will be happy to answer all your needs to make your stay even more enjoyable. The whole team will be happy to share with you its favorite addresses in Cannes.